For Halloween Monkeyfudge invited A&R to a box social, you put a game in a box and decorate it and then vote on the game. 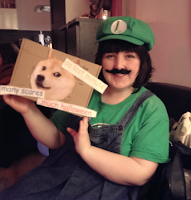 The box I'm holding below is Gavin's amazing box, I absolutely LOVE the Doge meme. My box was Mario themed. Since I had been Mario (Maria) before, this time I was Luigi (Luigia) it being the year of Luigi.